We booked two days off work for our challenge for two reasons. 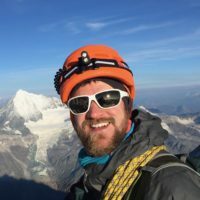 Firstly, we wanted a long, challenging mountain run that we could do together, and secondly, we both needed to do an ultra-distance training run in preparations for our upcoming goal races. Caroline and I are lucky enough to be able to run together several days of the week. We do most of our weekend long runs together too, as well as doing running and fastpacking holidays. 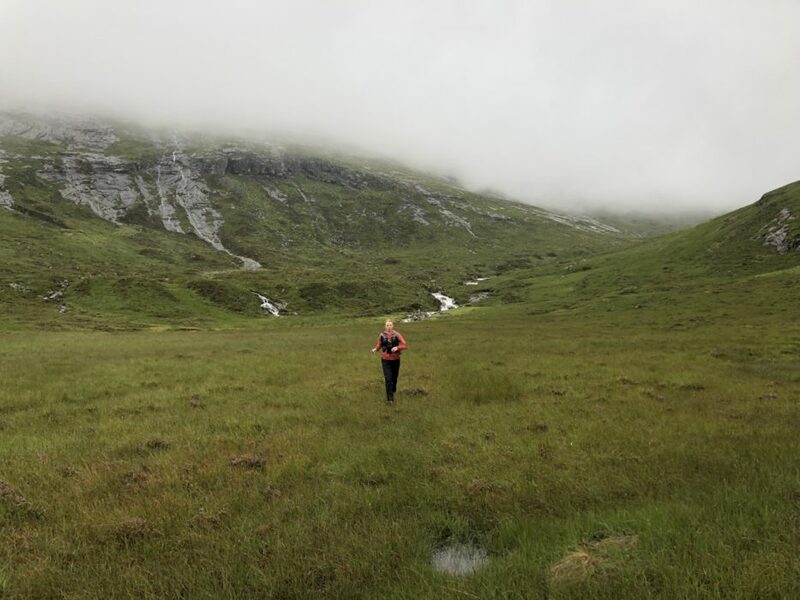 Coming from several years of fellrunning and racing, last year Caroline dipped her toe into the ultrarunning world with the Tromso Skyrace in northern Norway. She successfully completed that 50km+ race (which incidentally has 4500m of ascent and several kilometres of Grade 2 scrambling), and since then we have been looking for a massive run we could do together. I’m allowed to talk about my goal race – it’s the Ultra Tour Monte Rosa (170km/105 miles with 11,200m ascent), coming up in September. 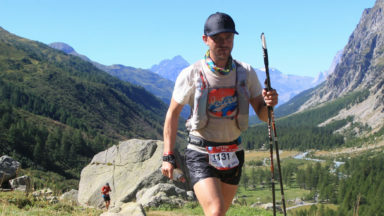 Having run one 100 mile mountain race before (UTMB, 2016), it’s clear that Monte Rosa is going to be a step up in difficulty and time on feet, so I’m preparing myself for a long, tough race that might take 45 hours. But Caroline is keeping her big race race a closely guarded secret (mainly because if she doesn’t talk about it, it’s not actually real). With a month before my race, and two months before Caroline’s, now was the ideal time to do a long run to test our bodies and minds and check how our preparations were going. 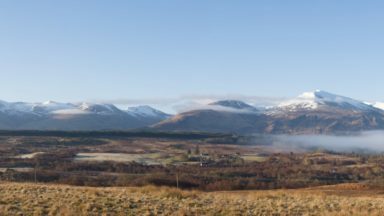 Our original idea had been to do the famous Lochaber route of Tranter’s Round: a classic 58km, 6000m ascent circuit of Ben Nevis, the Aonachs, the Grey Corries and the Mamores. After a bit more research, it became clear that Tranter’s might take us up to 20 hours! 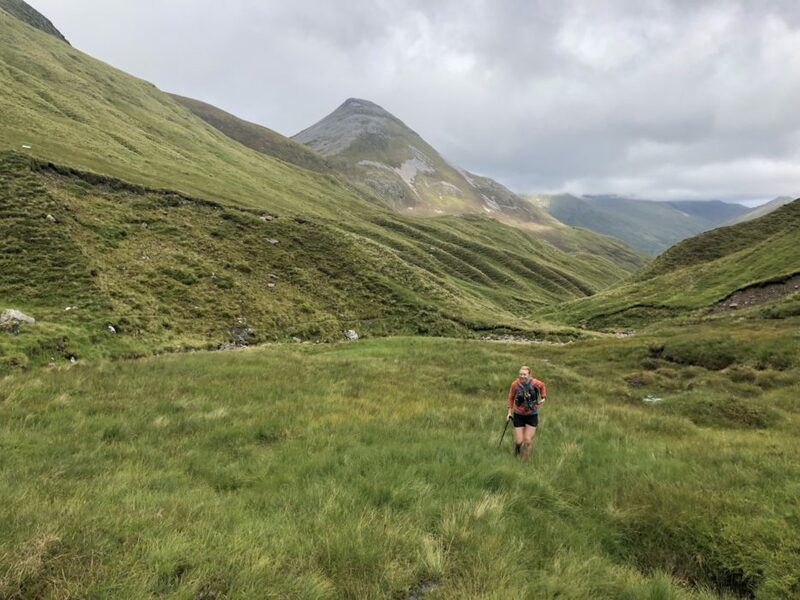 That felt a bit too long as a training run, so we began looking for other options, finally discovering the route of the Ben Nevis Ultra, one of the Skyline Scotland races. 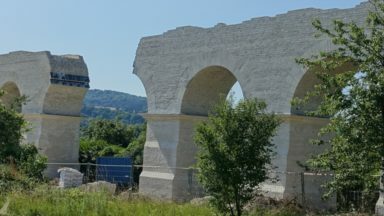 This newly created route is raced in September, but it looked perfect for us as a training run; about 50km, 4000m or so of ascent, with some big climbs to get your teeth stuck into. In the training for and racing of ultramarathons, I’m a firm believer in acting like a professional, even if you are mid-pack runners like us. You don’t have to train crazy-long hours, but you do need to train smart. 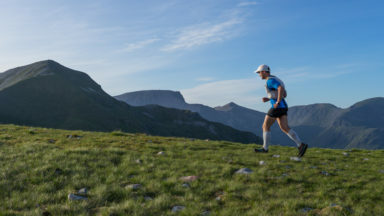 One of the most effective ways to behave professionally is to religiously practice your race day eating, drinking, clothing and equipment plan for several months before the big race. So that’s what we’ve been doing, and now we had a great opportunity to practice for a whole day. We adjusted the route by changing the direction and starting point. 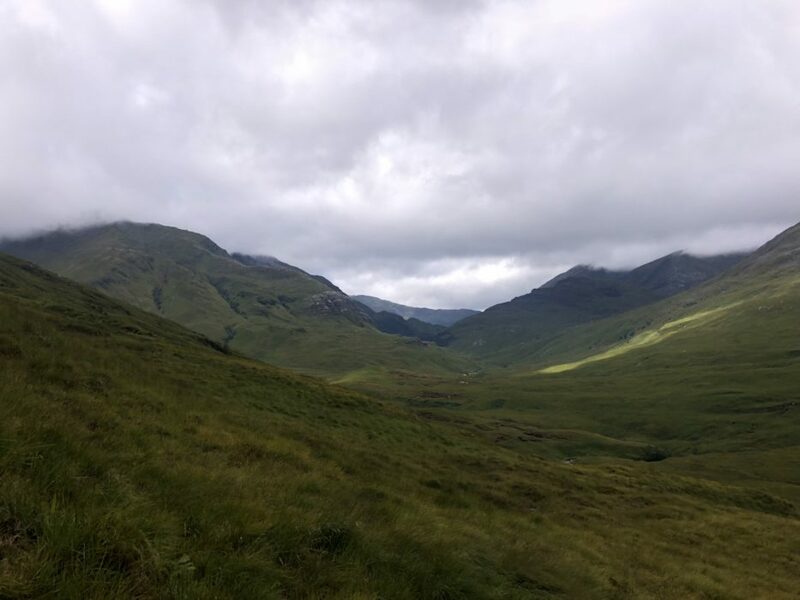 Here’s the route we took: Park in Glen Nevis, up Ben Nevis by the normal route, along the Carn Mor Dearg arete and down its east ridge, down Coire Guibhsachan to the Steall ruins, east along the glen then up to the lochan between Binnean Beag and Binnean Mor, south-west down to Kinlochleven, west along the West Highland Way path for a couple of kilometres, up Am Bodach, Stob Coire a’ Chairn and An Gearanach, down past Steall Falls, along the valley back to the car. 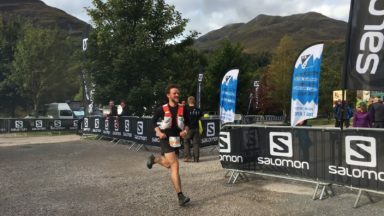 I’ve never been totally sure of what the fellrunning expression ‘steady away’ actually means, but I think it means something along the lines of running (or walking) at a steady pace, not getting too carried away by going too fast too soon, and staying well within yourself in terms of effort levels. 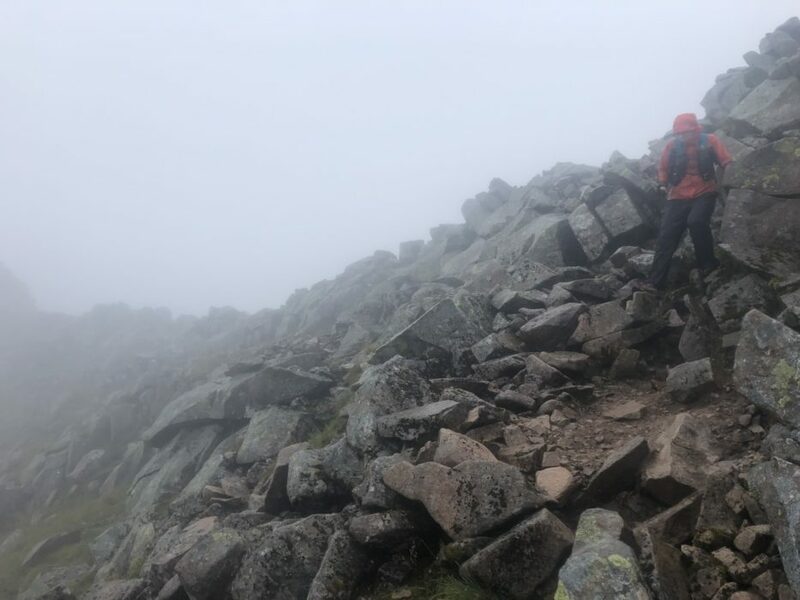 So it’s probably fair to say that if Caroline had asked me how I was doing during the first climb up Ben Nevis, I could have replied with “steady away”. 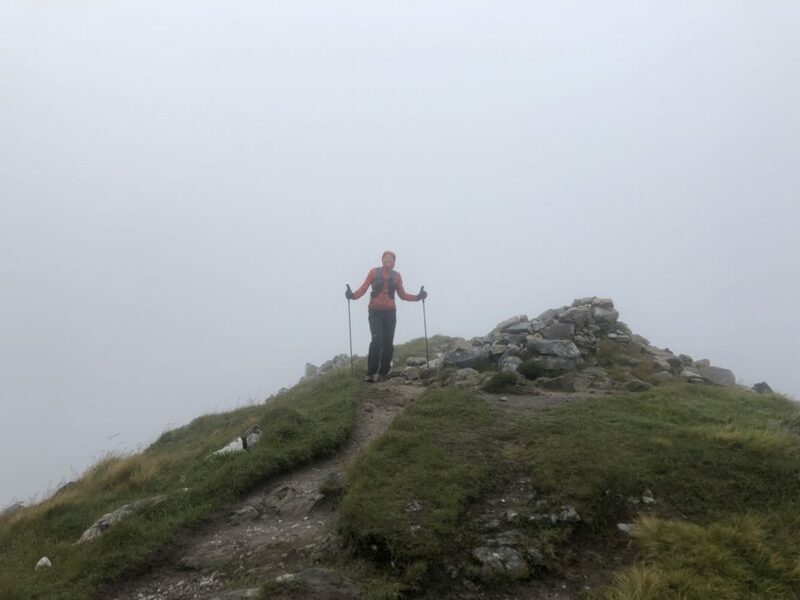 The day had dawned miserably, with low cloud, mist, moderate valley-level winds and light rain as we ate our breakfast (NB same as planned race day breakfast), so we weren’t exactly brimming with enthusiasm for a whole day spent in those conditions. Well who knows if it worked, but it allowed me to accept the weather for what it was and not let it bother me. The CMD arete is probably the best way up Ben Nevis for non-climbers. But today, going down it, there was a strong wind, no visibility and steady drizzle that made the going slower and the rocks slippery. In my comfortable 100-mile-race-oriented Nike trail shoes, the slickness of the rocks was heightened due to the type of rubber used on the outsoles. Whereas in the past I’ve got from the top of Ben Nevis to the top of Carn Mor Dearg in around 30 minutes, today it took about an hour as we had to be so careful with each step. 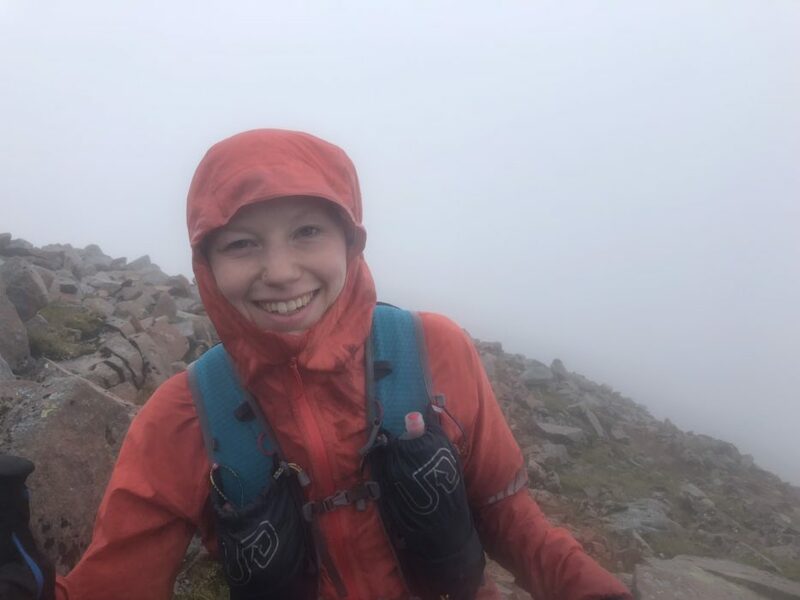 We had been wearing waterproof trousers since half way up Ben Nevis too, and by now mine had lost their breathability and were sticking to my clammy legs. 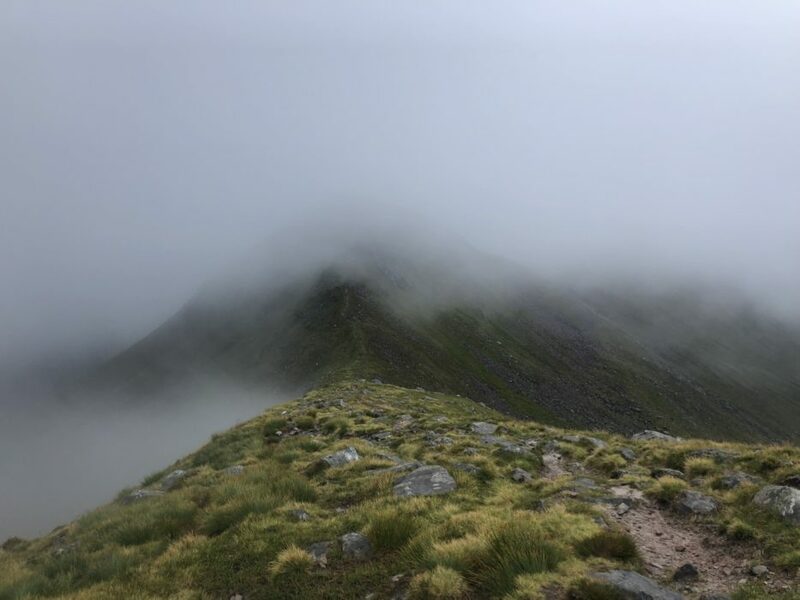 After descending the east ridge to the col before Aonach Mor, we dipped below cloud level and the rain abated. 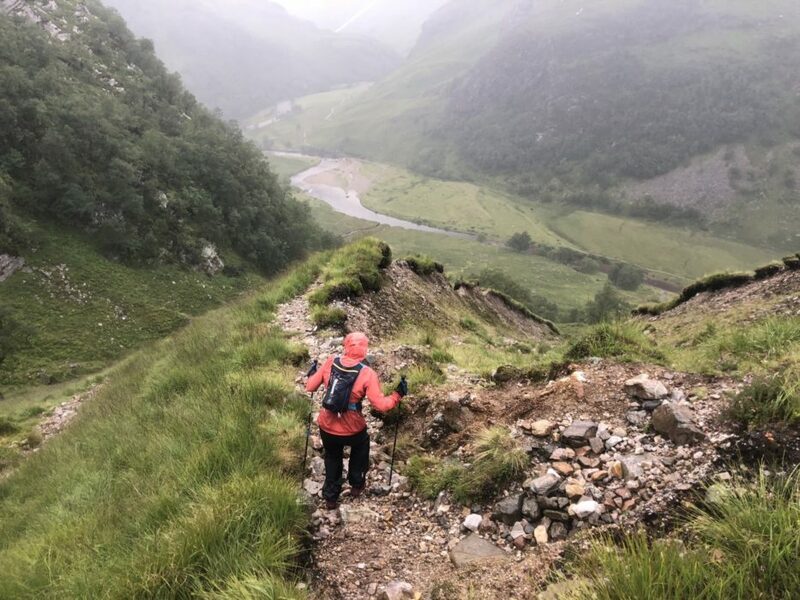 The boggy and rough descent down to Steall ruins in Glen Nevis was causing Caroline some problems: she had hit her ankle hard on a rock near the top of Ben Nevis, and any technical terrain was causing her a lot of pain. We wondered whether she had bruised a tendon or ligament on the ankle. 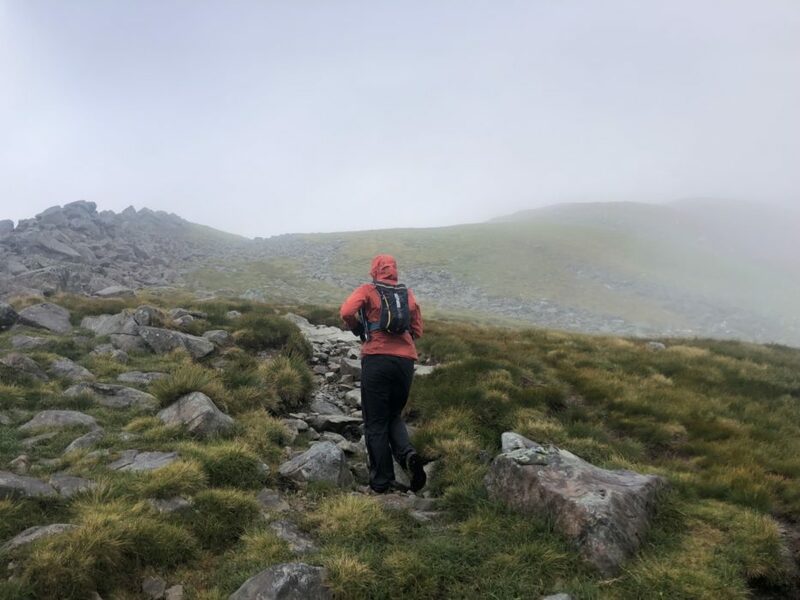 We didn’t think it would cause her any long-lasting issues, so we removed waterproof trousers, checked the map and got ready for the next section. 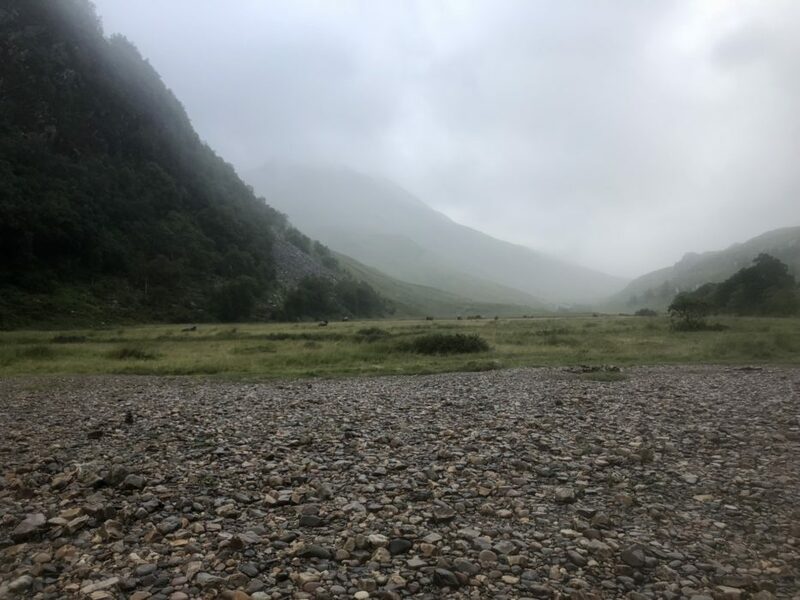 The ground in Coire Guibhsachan was totally saturated. In fact, we had wet feet for about 12 hours! The going so far had been slower than we expected, and I did wonder whether we had packed enough food for the adventure. I was also starting to get a bit tired with less responsive legs, which was a bit of a concern after only four and a half hours. The next section of the run looked fun though; a devious path through the Mamores, past several Munros to Kinlochleven. A lot of this was runnable, but sadly I wasn’t enjoying it much. I was just going through an early ‘bad patch’, but I hadn’t realised it. I thought that if my legs were tired so early on then the rest of the run would be miserable. 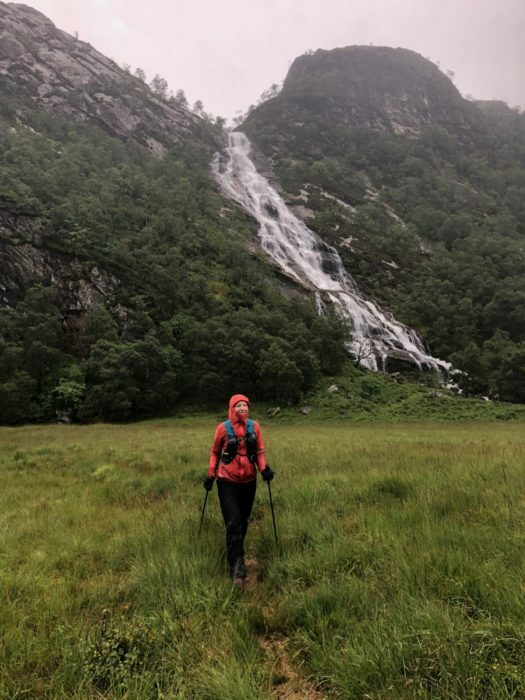 It was also hard to keep up with Caroline on the downhill to Kinlochleven – why did she have to go so fast? Eventually we got to Kinlochleven where we made a toilet stop and then went to the CoOp to buy some crisps. Caroline and I had been solidly eating one Tracker bar and one Stroopwaffel per hour, but after seven hours, we began craving something savoury – salty crisps did the trick. We were now faced with a climb of 1000 metres up to Am Bodach. We clearly didn’t go very fast up here because we took almost two hours for the ascent. I felt tired, and wasn’t enjoying the scrappy, wet path up the hill. Neither was Caroline. Then, as we hit the ridge and the wind and rain began to pummel us hard, my mood instantly changed. As we began doing battle with the elements, my legs came back to me, my mood lifted and I started feeling strong and powerful. And I then realised that it was just a bad patch I’d been going through for the past few hours and that things will always get better if you’re patient. Sadly, this wasn’t the case for Caroline as her ankle was very painful by now, meaning she had to move slower on the downhills. With no alternative faster descent back to the car, it was looking like she would have to gut it out all the way. 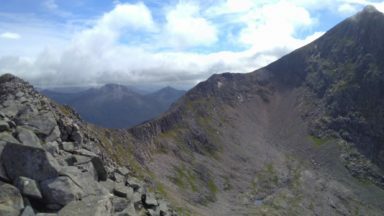 The final summits of Stob Coire a’ Chairn and An Gearanach passed without incident. By now we we had both switched from ‘food’ to gels, and both of us were still managing 250cal (Caroline) and 300cal (me) per hour as we had done for every hour of the run so far. A long descent down to Glen Nevis and a river crossing brought us in front of the mighty Steall Falls, heavy with water with all the rain. There were tourists here, having walked the ten minutes from the car park to see the famous waterfall. It felt suddenly strange to come into contact with clean and dry people! Soon, we were on the road, which we elected to follow all the way back to the car. With 10km to go, we discussed whether Caroline should walk and I should run back to the car to pick her up. The pain in her ankle was causing her considerable pain, which was hard for me to see. But she is so determined and stubborn that I knew she would want to finish this run properly, so we just got our heads down and ran. Finally, the car came into view and we were done. 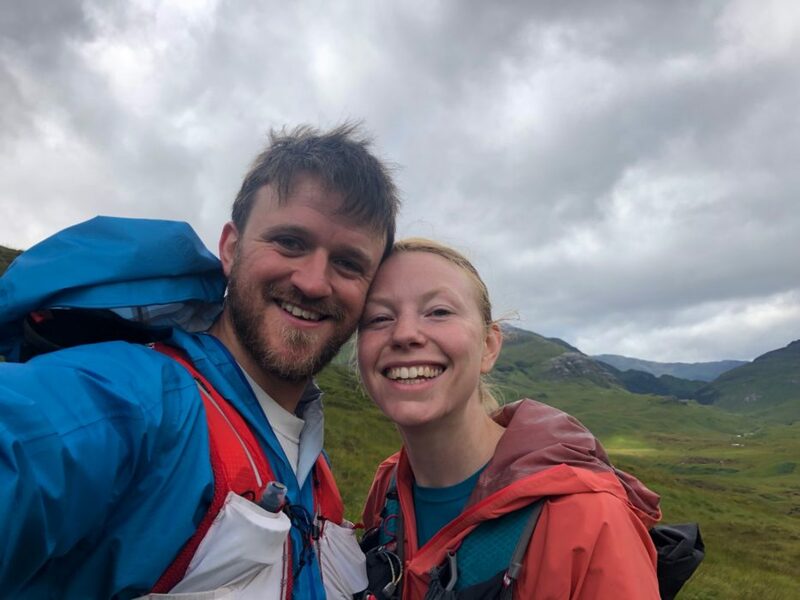 We forgot about the selfie we’d promised to take on finishing, and instead drove straight to the Ben Nevis Inn – we were only an hour late for our dinner reservation! We’re still friends and Caroline’s ankle injury was just a bruise, thankfully!